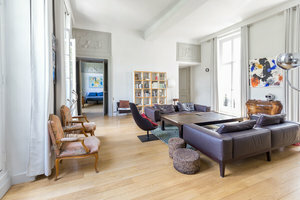 Located in Le Marais steps away from Place des Vosges and Musée Carnavalet, this beautiful loft is in a prime location. It is a perfect opportunity for a Private Sale, Product Launch or Fashion Showroom. This extensive loft space is adaptable with a modular layout including 4 interconnected rooms as well as a mezzanine. The interiors here are sophisticated and modern with white walls and grey detailing throughout as well as wooden floors. There are also plenty of amenities that come with this space including furniture, a kitchen, internet and office equipment. 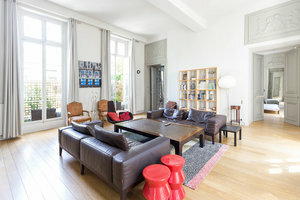 Situated in one of the most fashionable areas of Paris, this space is in a prime area that is easily accessible. This is a great opportunity for brands and designers to connect with customers with an unforgettable pop-up event.